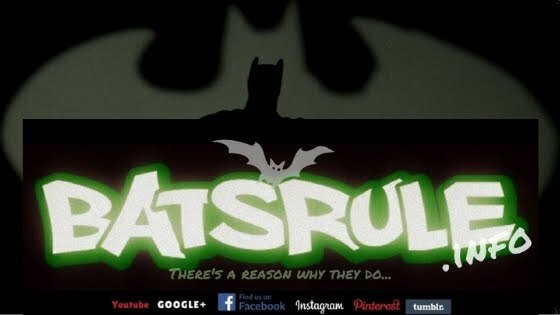 What is the difference between Megabats (megachiroptera) and Microbats (microchiroptera)? 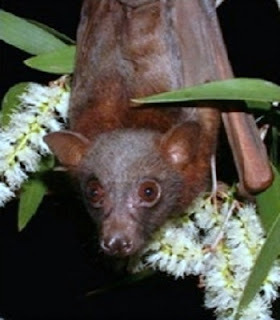 Megabats eat fruit, pollen, or nectar. They have a well-developed visual cortex and shows good visual acuity. Also, the sense of smell is excellent in these creatures. 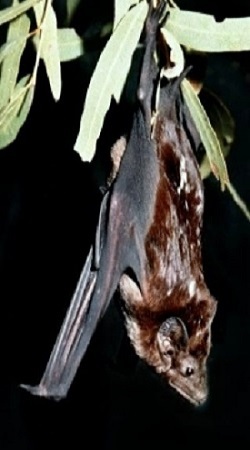 In contrast to Microbats, Megabats do not, as a rule, use echolocation (with one exception, the Egyptian fruit bat, which uses high pitched clicks to navigate in caves). 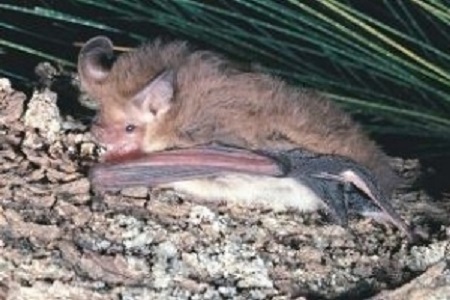 Microbats use echolocation, whereas Megabats do not (except for Rousettus and relatives). 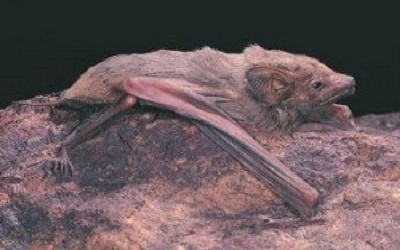 Microbats lack under fur; they only have guard hairs or are naked. 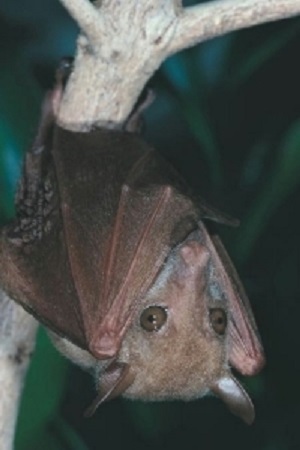 Microbats eat insects, blood, small mammals, and fish. 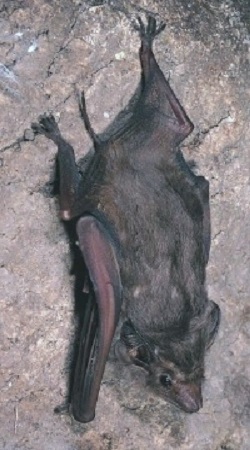 Bats are mammals which give birth to live young and produce milk to feed them. Over ninety different kinds occur in Australia. 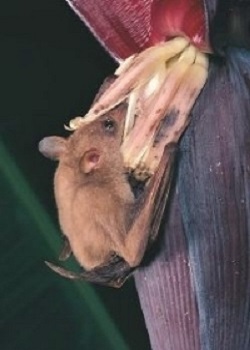 Most eat insects, but eight feed only on flowers and fruit, and are known as fruit-bats or flying-foxes. 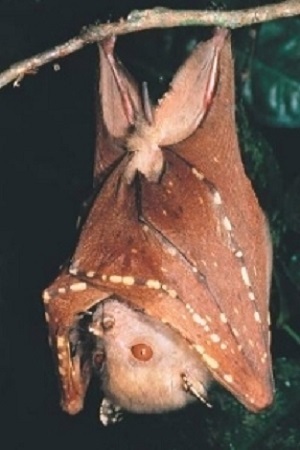 Four of these are amongst the world's largest bats. They may weigh up to one kilogram and their wings may span more than a metre. The preferred food of Megabats is the blossom of eucalypts and some other native trees, and various bush fruits, like Moreton Bay Fig. 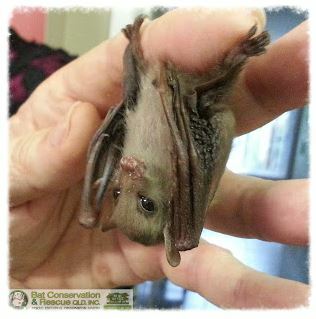 The bats are beneficial to the trees because they act as pollinators and disperses of their seeds. The great distances they can fly means they carry pollen and seeds far from the parent tree. 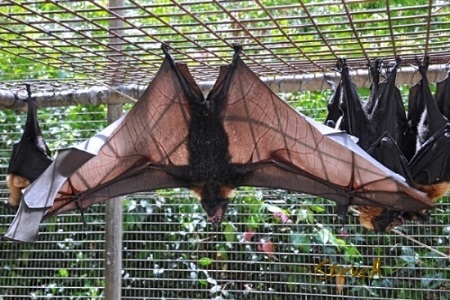 Camps are places where the large Megabats gather during the day, sometimes in many thousands. Along the coast they may be in mangroves, further inland they are often in deep gullies or rainforest patches, and west of the Dividing Range they are usually along water-courses. Their location may be known only to a few local people. The same campsites tend to be used year after year, although not necessarily every year, or all year round. Widespread shortages of natural food, such as occur during droughts, may cause large numbers of animals to move well beyond their usual range in search of food. This applies particularly to Little Red Megabat, which occur further inland than the other species. Bats are the only group of mammals that are capable of powered flight. The scientific name for the group (Order) to which bats belong is Chiroptera that means 'winged hands', and gives an indication of the specialised adaptations that allow them to fly. Their 'winged hands', are greatly extended bones in their fore-limbs (our hand and arm bones) that are joined with a leathery membrane to form wings. 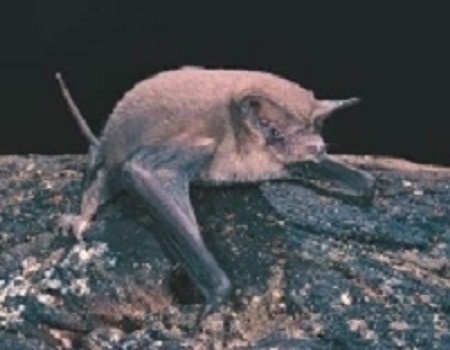 Bats wings have evolved to be very efficient in flight. As their wings are thinner than birds' wings, they are more maneuverable in flight. The membrane, which makes up the wing, is made of skin that is very soft, strong, flexible and able to repair itself if punctured. 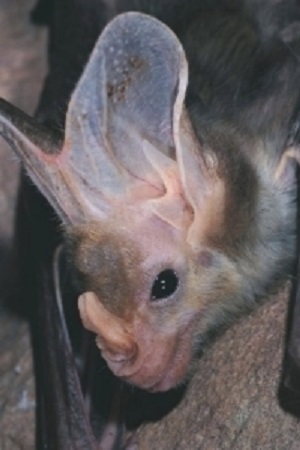 The thumbs of bats are left free from the wing, and they used it to groom themselves and cling to roosts. 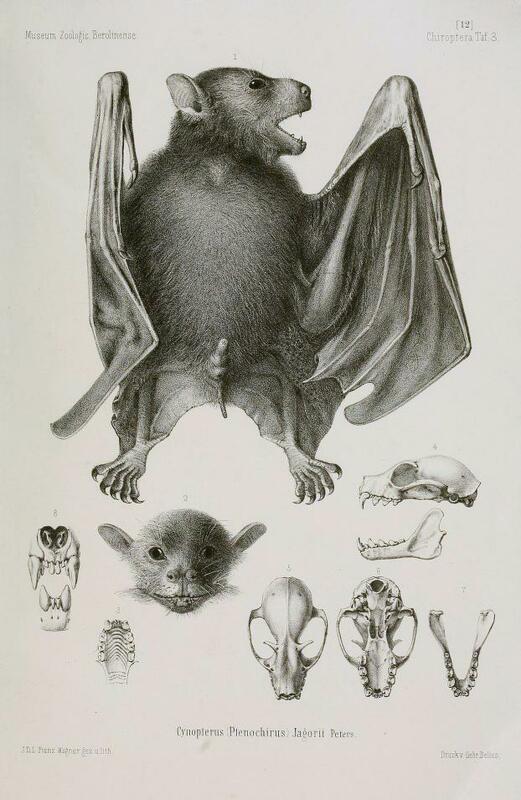 The black Megabat was first described by Temminck in 1837 from a specimen from Menado, Indonesia. 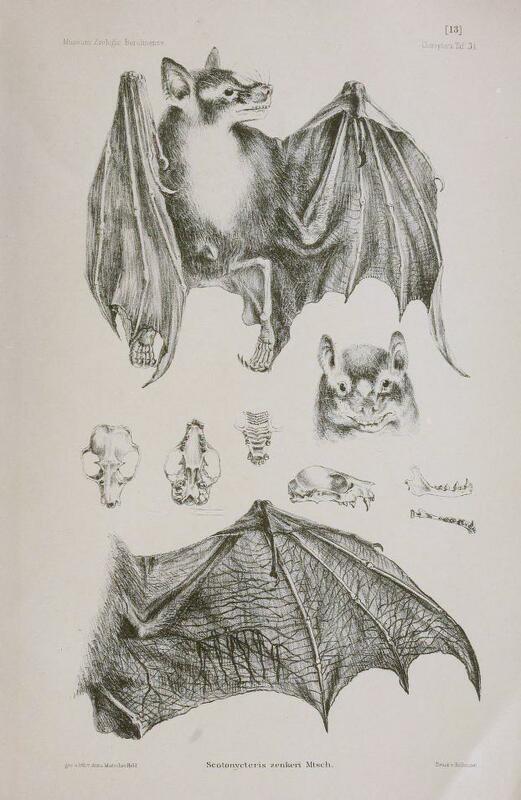 In 1867, Peters described a black flying fox from Rockhampton. The south-eastern limit of black flying-foxes has been moving southwards for at least 60 years. In 1930, the southern limit was Rockhampton and in 1960 it was the Tweed River, northern NSW. 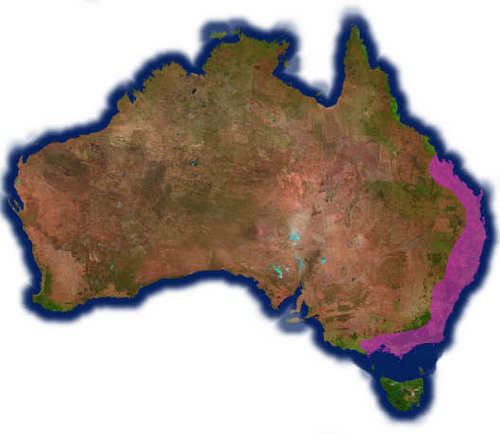 By 2002 they could be found further south than Port Macquarie. Jet black fur but some variation does occur. Chocolate-brown patch of fur is often seen on the back of its neck and shoulders. Brownish fur around eyes and on face. Some have frosting of greyish tips all over their body, particularly on the belly. The lower leg is unfurred. Wide range of habitats of tropical and subtropical forests and woodlands. 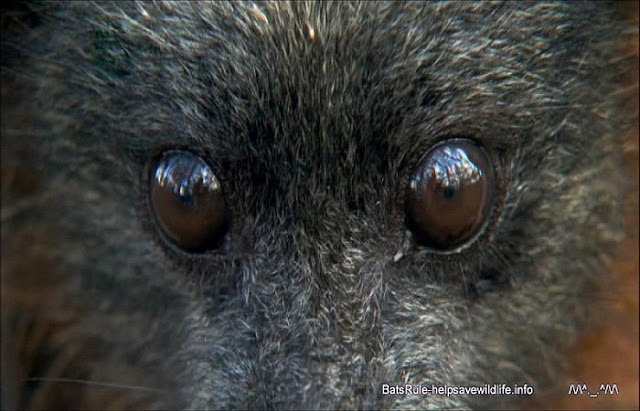 Black Megabats can live up to 14-20 years in the wild. In southern Queensland adults mate in March and April, females become pregnant before dispersing for the winter months. Congregate into camps from early to late summer where the young are born and raised. Young are carried by the female until about 4 weeks of age and then left at the roost while the mother forages at night. Young begin to fly at 8 weeks of age but depend on their mothers for at least 3 months. Fly out at dusk to feed on blossoms and fruits. Prefer blossom of eucalypts, paperbarks and turpentines, as well as a variety of other native and introduced blossom and fruits. Have been seen to eat the leaves of trees by chewing the leaves into a bolus, swallowing the liquid and then spitting out the fibre. During the day, black Megabats roost on tree branches in camps and fly out at dusk to feed. Main camps form in summer and may contain tens to hundreds of thousands of individuals, depending on local food availability. Can hold and manipulate food with clawed thumbs. They will wrap their wings around themselves if cold or wet. Groups will travel up to 50km from their camps to foraging areas and will use the same camp for many years. Black Megabats are found around the northern coast of Australia and inland wherever permanent water is found in rivers. Barbed wire fences, fruit tree netting, power lines, dog attacks, hit by a vehicle. 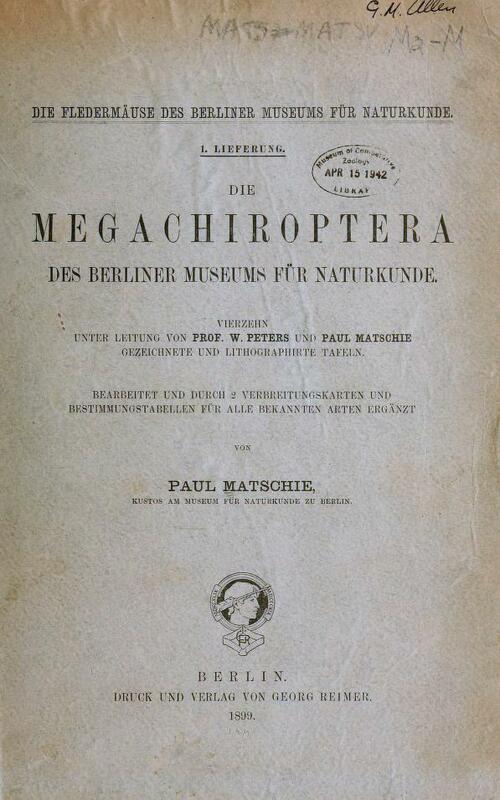 The grey-headed Megabat was the first Australian flying fox species discovered by Europeans. 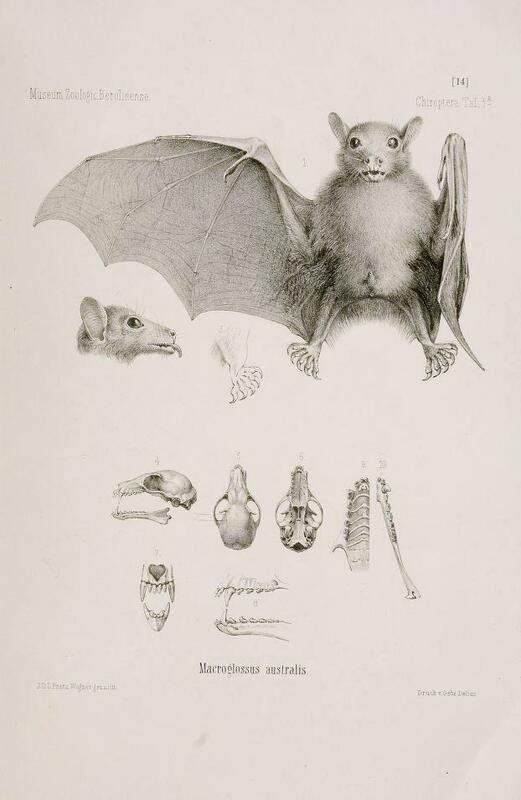 The first grey-headed flying fox specimen was reported as collected in New Holland and described by Temminck in 1825. Their numbers have declined drastically since European colonisation from many millions to a few hundred thousand. The known range for grey-headed flying foxes has contracted southwards by about 750 km and their southern limit during winter has expanded into Victoria. 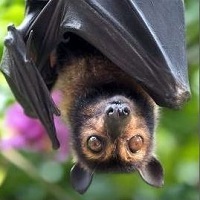 They are the largest Australian fruit bat and are endemic to Australia. Grey-headed flying foxes have sophisticated vocal communication, making more than 30 specific calls. Grey-headed Megabats are the largest of the four mainland species in terms of body size in Australia. Grey-headed Megabats are the only Megabat species with a collar of orange/brown fur that fully encircles the head. Grey-headed Megabats are the only species with fur right down their legs to the toes. Head covered in grey fur. Belly fur grey with flecks of white or ginger. Back fur can be dark grey or can have silver or frosted appearance (might be related to age/moult/sub population). Live in a large variety of habitats. Occur in rainforest, mangroves, paperbark swamps, wet and dry sclerophyll forests and cultivated areas. Long-lived, average age of reproduction is 6–10 years. Generally have one offspring a year. Pregnant females congregate in maternity camps a couple of weeks before giving birth in September-October after a gestation period of 6 months. Females carry young while the forage for the first three weeks of life. After first three weeks, young are left at the camp while females forage at dusk. The females find their young by scent when they return to camp. Forage on fruits and blossoms of more than 80 species of plants. Prefer eucalypt blossom with native figs being the most popular fruit. Chew leaves and appear to eat the salt glands from mangroves. They also forage in gardens, parks and orchards and may fly many kilometres from roost site to feed, some round trips are about 30 km. Congregate in large camps of up to 200,000 individuals from early until late summer. 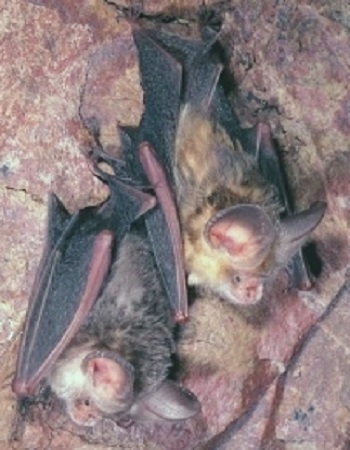 Camp populations can include grey-headed, little red and black Megabats. Camps commonly formed in gullies and close to water. Nightly feeding range of 20-50km from camp. In winter, adults can migrate up to 750km from their summer camps. 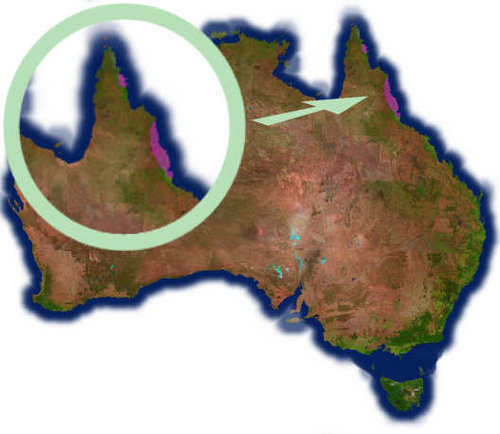 Occurs along the east coast of Australia from Rockhampton to western Victoria and inland to the western slopes. Federally listed as Vulnerable under the Environment Protection and Biodiversity Conservation Act 1999. 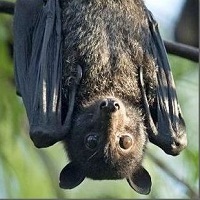 Is a species of Megabat native to northern and eastern Australia. 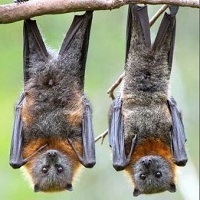 Little red Megabats are the most widespread species of Megabat in Australia and the only species of Australian Megabat that regularly roosts in clusters – up to 30 have been seen hanging together in a tight bunch. The weight of their clusters can cause severe damage to their roost trees. They are nomadic and their movements depend on food resources. 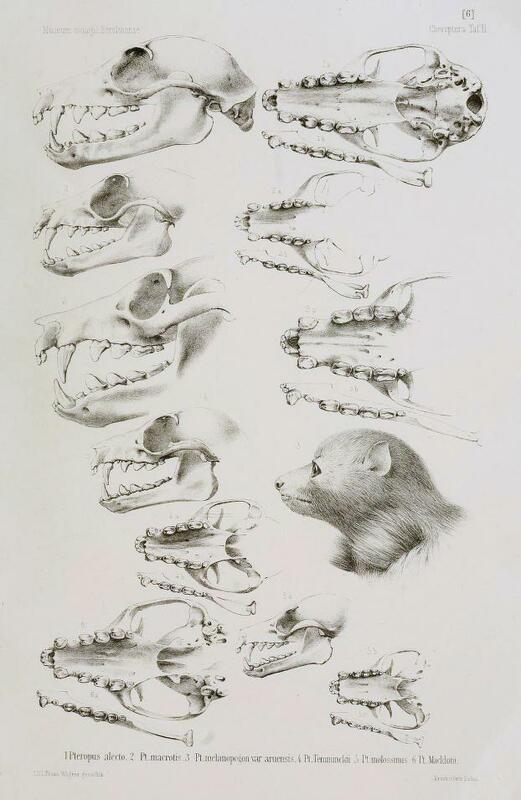 Peters first described the little red flying-fox in 1862, from a specimen collected on Cape York. 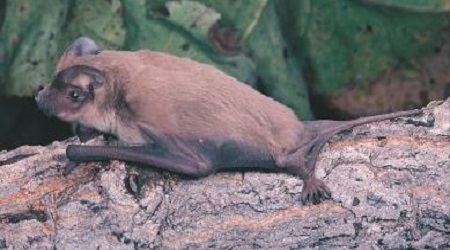 Little red Megabats vary in colour from reddish brown to light brown, and there are patches of light, creamy, brown fur where the wing membrane and shoulder meet. Head is covered with greyish fur and, in some forms found in northern Queensland, grey fur continues down the back. Wings are brown and semi-transparent when seen flying during the day. This helps identify the species. Average weight 300–600g it is the smallest Megabat in mainland Australia. Broad range of habitats that includes semi-arid areas to tropical and temperate eucalypt forests, paperbark swamps and monsoon forests. Little red Megabats form large camps for mating that can include up to 100,000 individuals. Mating occurs November–January, young are born in April and May. Males have harems of two to five females in small, defended territories. Young begin to fly at two months. Female cares for young for several months while they develop the basic skills of finding food. Prefer nectar – especially eucalypt, bloodwood and angophera nectar. Will eat fruit, sap and insects and cultivated fruit when other resources are unavailable. In northern Australia, little red Megabats sometimes leave their roost sites before dark and feed during the day on overcast wet season days. Often crash land in trees and need to climb a tree limb to take off again. Efficient climbers that use their jointed thumbs as well as feet to climb about. Prefer to roost near the ground. Only travel 20–30km from camp to feed. Little red Megabats from Shark Bay in Western Australia round the north coast to Queensland and south to northern Victoria. Have been recorded in South Australia. As nomads they range a long distance inland, depending on the availability of flowering trees. Fruit tree netting, power lines, dog attacks, hit by a vehicle. Barbed wire fences – little red Megabats fly low and are frequently caught on fences only a metre or so off the ground. Listed as Lower Risk Least Concern according to the IUCN Red List of Threatened Species. 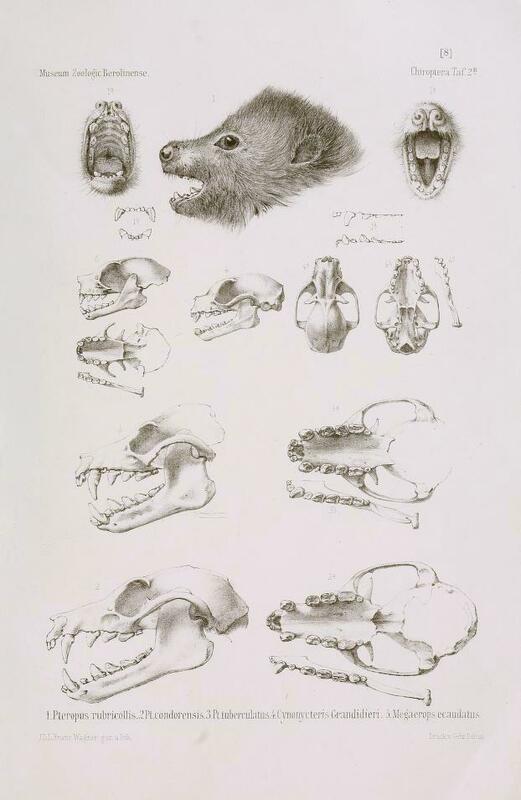 Spectacled Megabats were first described in 1850 by Gould from a specimen collected on Fitzroy Island. They are important seed disperses and pollinators of rainforest flora. Spectacled Megabats have the smallest known distribution and smallest population of the four Australian mainland Pteropus Megabats. 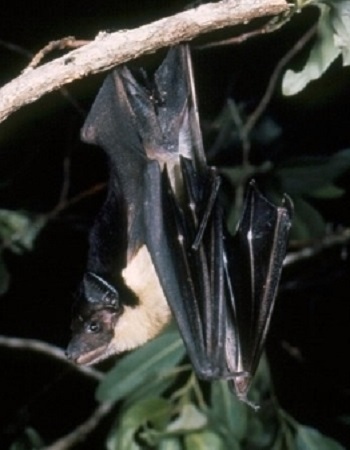 Spectacled Megabats have distinctive straw-coloured fur around the eyes which gives them their name. Black with pale yellow "spectacles". Eye rings can sometimes be indistinct and they will look similar to black Megabats. Pale fur on shoulders can vary between individuals. 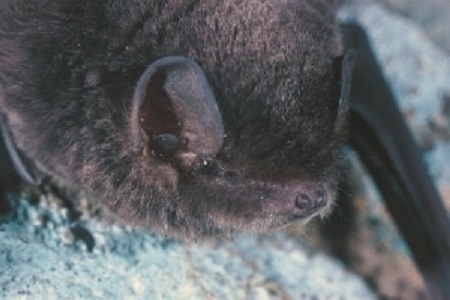 Pale yellow fur often found on shoulders and back of neck. Tall rainforests, gallery forest, mangroves or paperbark forests. It is also found in New Guinea and on the offshore islands including Woodlark Island, Alcester Island, Kiriwina, and Halmahera. Little is known about the life span of Spectacled Megabats in the wild, but can live in captivity for 17 years. Mating common throughout first half of year but conception only in March–May, single young born October–December. Mothers carry the young for 3–4 weeks. Older young stay at the camp until they start to fly. Specialist fruit eater that feeds mostly on rainforest fruits, some eucalyptus nectar and pollen. Disperses seeds of at least 26 species of rainforest canopy trees. Usually roost in single-species camps. Territorial and aggressive at rich food resources. Forage only during the night. Coastal Queensland from Tully to the tip of Cape York and islands in Torres Strait. Spectacled Megabats are generally found in or around rainforests and sometimes in mangroves associated with black Megabats. Approximately 194 000 animals in the total population. Habitat destruction through large-scale clearing of coastal and upland habitats for sugar, grazing and urban development. Mortality due to paralysis tick (Ixodes holocyclus). Death of unknown numbers on barbed wire fences and power lines. Predators – dogs, and cat. They are considered vulnerable due to a significant decline in numbers as a result of loss of their prime feeding habitat and secluded camp sites.